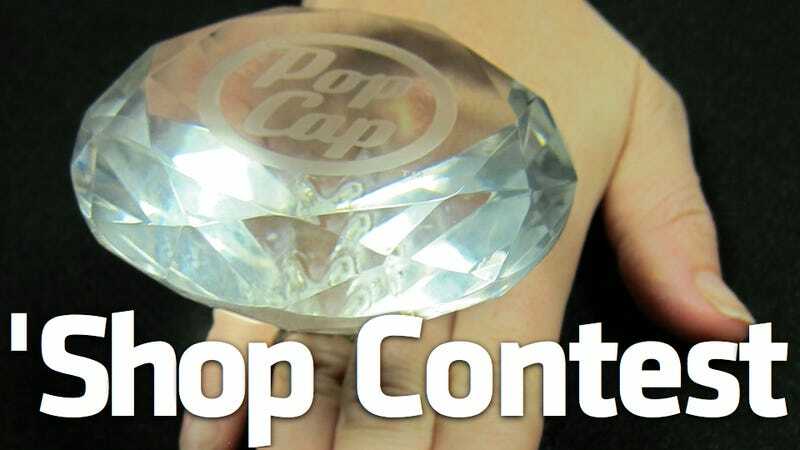 This gargantuan diamond ring PopCap gave to a Bejeweled fan for her wedding may be a fake. That doesn't mean we can't make it faker. 'Shoppers, quick, to the GIMP poles! Sotheby's appraises this at around a 7 for exploitability, meaning it falls short of the "Shops itself" standard but still supplies a high degree of lustrous funny. Given the lack of other objects here, you'll probably have to use your imagination, like that other ring-wielding superhero likely to see at least one entry below. I have confidence you can find a new setting for this gem that makes both it and its wearer look radiantly ridiculous. Alright? All good? Great. Gentlemen, start your 'shopping!